Prohibition outlawed the manufacture and sale of alcohol on January 17, 1920, which was also the 21st birthday of legendary bootlegger Al Capone. He was a short man, about the same height as Piper in heels. But even in his white dinner jacket and bow tie, she could tell he was solid muscle. Piper walked into the club and the man closed the door behind her. “I’m looking for a man called Lobster Bill,” she said, recalling the nickname Collins had given her father. “Lobster Bill. Ya don’t say?” said the man in the dinner jacket. He studied her without saying another word. Piper decided to try a different angle. “Master Therion sent me,” she said. The short man raised an eyebrow. He then called over a larger man in a dark suit. Joe led Piper across the dance floor and through a red door that led to a spiral staircase. She tried to keep up with him but her heels made it difficult to go any faster. The man led her down a tunnel and through some beaded curtains that led to a windowless room filled with smoke. Everyone in the room seemed to be holding a lit cigarette. The only thing worse than the reek of the smoke was the stench of all the sweaty bodies huddled together. Sophisticated gentlemen in suits and tuxedos stood at a mahogany bar nursing snifters of amber liquid. Flitting in and out of the men, fluttering about in dazzling sparkles and shimmering bugle-beads, were a host of fashionable debutantes in feather boas and pastel chiffon party dresses. Contempt for Prohibition was a factor in the rise of the flapper. With legal saloons and cabarets closed, back alley speakeasies became prolific and popular. This discrepancy between the law-abiding, religion-based temperance movement and the actual ubiquitous consumption of alcohol led to widespread disdain for authority. Oh, God. I’m in hell, Piper thought. “Wait here,” Joe said, depositing her in the midst of the party girls. They pressed in around her, blocking her view so she had no idea where the doorman went. Piper just shook her head and cast her eyes toward the ceiling. A clumsy waiter in a red vest passed with a tray of mismatched teacups, coffee mugs, and glasses. Piper recognized him at once. “You look ridiculous,” she said to Sal. His trousers dragged on the floor and the vest was so tight she thought the buttons might burst at any second. “Best I could do at the spur of the moment,” he said almost defensively. Sal put the tray down and came closer so she could hear him over the music. Sal led the way, elbowing his way through the crowd. “You spilled my drink!” one girl shrieked, holding her glass in front of her. Piper held her hands up in apology. “I really have to go,” Piper said, trying to back away from the gathering horde of flappers. “Wait a minute! Kay has that same handbag too. And she told me it was one of a kind,” the brunette said. “Ladies, please—we have to get through,” Sal said. “Do you even know who you’re talking to?” one of the flappers shouted at Sal. But she didn’t finish. All the girls gaped at Piper and took a step back. Piper touched her cheeks. They felt warm. All of a sudden, she felt something pinching her ear. She looked over and saw a pale hand with filed fingernails pinching Sal’s as well. “Ow, ow, ow!” they both screamed. 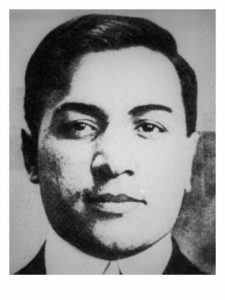 During Prohibition, Frankie Lamiano was one of Brooklyn’s biggest bootleggers. On February 6, 1921, he was ambushed and sustained a severe lung wound that should have killed him. He later renovated the back room of the Adonis Club to serve as his headquarters, where he employed a young Al Capone. “Why are you nippers causing trouble in my club?” a man asked in a calm but commanding voice. Piper looked at him from the corner of her eye and saw that he was no ordinary man. In his blue pinstriped suit and tilted-up fedora, he was definitely a gangster. But his white skin and oiled black hair made him look exotic in a Valentino sort of way. “Um, we were just leaving…Sir,” Sal stammered. “You ain’t givin’ me the bum’s rush,” the flapper argued. The man leaned closer to the girls and Piper could see his eyes burning red. Without saying a word, the black-haired flapper and her friends picked up their handbags. Long strands of pearls bounced in unison against drop-waist dresses as the girls drifted single-file through the beaded curtain. “And you thought my powder was impressive,” Sal mumbled to Piper. The man hustled them toward the back of the club, opened a plain black door, and tossed them into another windowless room. This one didn’t smell like smoke, liquor, or sweat. It smelled like a butcher’s shop. Piper and Sal fell to the floor at the foot of a player piano that was performing an old ragtime melody. When they got to their feet, Piper dusted off the taffeta dress and looked around. To her relief, there were no flappers. Piper turned around. A familiar gray-skinned man with a rat-whiskered mustache pushed his chair out and took several strides toward them, his fingers tensing around a glass of ruby liquid. 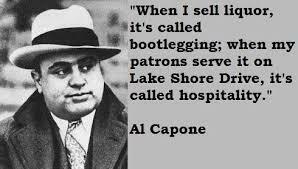 Tagged #alcapone, #BootleggersDay, #booze, #flappers #prohibition, #speakeasy, #TempletonRye, 1920s, al capone, Bootlegger’s Society.